It’s rare that you walk into a car showroom and they don’t try and sell you something. You’ll also notice that all the cars on display are different makes as well and… they’re all plugged in. The EV Experience Centre is the UK’s first brand neutral centre for electric vehicles. They’re aim isn’t to sell you a car but instead to provide completely free education about electric vehicles. You’ll notice it’s not a school classroom, with cars to look round and interactive displays including a giant map showing all the locations of charging points across Milton Keynes and the country. Any question you have from driving range to running costs will be answered by the EV Gurus who will also set you up with a 20 minute test-drive. And if 20 minutes isn’t enough and you want to experience owning an electric car on a day-to-day basis, they also provide week-long vehicle loans. 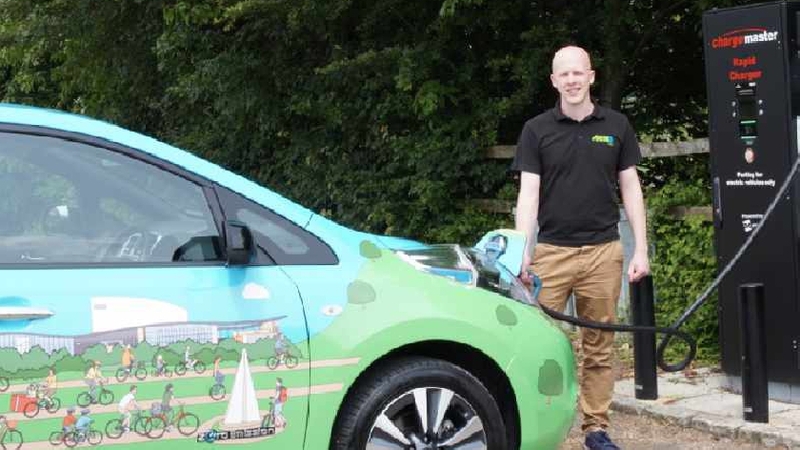 Milton Keynes is the perfect place to drive electric cars, with over 300 public charge points as well as offering free parking not only at the charging points themselves but also in purple parking bays across the city. Milton Keynes Council and the government have invested a huge amount of money to make having an electric car as easy as possible. If you can’t have a Homecharge unit installed at your home, MK Council will install a charge point within a close distance to your home. They’ll also install free charge points at your business so you can charge at work. Although the upfront costs tend to be more than a petrol/diesel car, there are many cost savings in the long run. As well as free parking, there is currently a government grant of up to £4500 and the fact you’ll never buy petrol again! As well as being cheaper, quieter and faster, you’ll be able to commute to work with peace of mind that you’re playing a key role in lowering the carbon emissions in the centre of Milton Keynes.